R.J. Rushdoony: 00:01 Leviticus 25:1-17. The Sabbath and light. Leviticus 25:1-17. “And the Lord spake unto Moses in mount Sinai, saying, ‘Speak unto the children of Israel, and say unto them, When ye come into the land which I give you, then shall the land keep a Sabbath unto the Lord. Six years thou shalt sow thy field, and six years thou shalt prune thy vineyard, and gather in the fruits thereof; but in the seventh year shall be a Sabbath of rest unto the land, a Sabbath for the Lord. Thou shalt neither sow thy field, nor prune thy vineyard. That which groweth of its own accord of thy harvest thou shalt not reap, neither gather the grapes of thy vine undressed, for it is a year of rest unto the land. And the Sabbath of the land shall be meat for you; for thee, and for thy servants, and for thy maid, and for thy hired servant, and for thy stranger that sojourneth with thee. And for thy cattle, and for the beasts that are in thy land, shall all the increase thereof be meat. R.J. Rushdoony: 01:26 And thou shalt number seven Sabbaths of years unto thee, seven times seven years, and the space of the seven Sabbaths of years shall be unto thee forty and nine years. Then shalt thou cause the trumpet of the jubilee to sound on the 10th day of the seventh month. In the day of atonement shall ye make the trumpet sound throughout all your land, and ye shall hallow the 50th year, and proclaim liberty throughout all the land unto all the inhabitants thereof. It shall be a jubilee unto you, and ye shall return every man unto his possession, and ye shall return every man unto his family. A jubilee shall that 50th year be unto you. Ye shall not sow, neither reap that which groweth of itself in it, nor gather the grapes in it of thy vine undressed, for it is the jubilee. It shall be holy unto you. Ye shall eat the increase thereof out of the field. In the year of this jubilee ye shall return every man unto his possession, and if thou sell ought unto thy neighbor, or buyest ought of thy neighbor’s hand, ye shall not oppress one another. R.J. Rushdoony: 03:28 The death penalties that are associated in the Old Testament with respect to the Sabbath conveys two very obvious assumptions. First, the Sabbath laws, obviously, involve a principle so important, so big that violation was regarded as a capital offense. While the punishment of death by civil law is removed, it is still in some sense a capital offense. This means, second, that the law conveys to us the fact that violation is a kind of death in and of itself. Similarly, obedience is a kind of guarantee of life. R.J. Rushdoony: 05:57 So, I raised the question, “Well, what did you do for a disinfectant?” He said, “Oh, something out of the kitchen.” I couldn’t guess what it was. I guessed salt which, of course, he said was wrong. It would cause serious damage. He said, “I packed any wound or infection, or any surgery that I had done with sugar.” He said, “Now, any woman who makes jelly knows that if that jelly, or jam, has a high sugar content she doesn’t have to worry about sealing the jar. The sugar will preserve it. But, if it is canned peaches and the sugar content is not sufficiently high there she has to seal that carefully.” But, he said, “This has become so routine with us we’ve lost the meaning of what we’re doing.” And so it is. R.J. Rushdoony: 07:06 We observe many things like the Sabbath. We’ve lost the meaning of it. It’s become routine, and the meaning is gone, and so little by little the observance goes, because we don’t understand the principle behind it. So, when we approach it we approach it ignorantly without realizing what it’s all about. You have to know the meaning to understand anything that you observe, or see, or practice. I cite another little illustration. When I was in school I was taught that when a Roman General returned to Rome and he was given a triumphal march into the city, a slave always ran before him, beside his chariot, repeating, “Remember that you are a man.” How the teachers who cited this to me in Latin class, and elsewhere, said, “This was an example of the humility that was to be expected of the General at this point.” They were looking at the whole episode from a Christian perspective. R.J. Rushdoony: 08:30 Recently as I was studying an analysis of Roman art by Heinz Kohler I was interested in his comment. He pointed out that this statement by the slave, “Remember, you are a man.” Meant that he was a god. That’s a startling fact but, you see, the Roman definition of a man was different from the Christian definition, and he reads that or listen when a teacher tells it to us in Latin class, and we read in terms of a Christian meaning of what constitutes a man, and it’s a statement of humility. But, from the Roman perspective you are now a man, that is you are joining the ranks of those who are gods. Up until now you are subhuman, but now you are a man, you are with the gods. R.J. Rushdoony: 09:35 Now, as we analyze the Sabbath, let us see it not in terms of what the world today sees it as, or what ministers today may see it as, but in terms of scripture. Jesus Christ declares, “The Sabbath was made for man and not man for the Sabbath; therefore, the Son of Man is Lord also of the Sabbath.” The Sabbath was made for man, but it’s not man who is the Lord of the Sabbath, but the Son of Man, Jesus Christ. In other words, the redeemed man, the second Adam, the fountainhead of the new humanity is Lord of the Sabbath and, therefore, the Sabbath was made for the perfect man, Jesus Christ, and for the redeemed of Christ, for us, as a principle of life and regeneration in Him. R.J. Rushdoony: 10:43 Now with that, let us turn to the law itself. First, as we have seen last week, the primary meaning of the Sabbath is rest, not worship. Only that worship which is a rest and refreshing to man is a part of the true Sabbath rest. The second, we cannot view the Sabbath exclusively in terms of man, although it is centrally concerned with man. We must approach the Sabbath from the standpoint of the whole Earth as the scripture does. Now, the commandment makes it clear that it affects man and beast alike, and the vines and the trees of the field, and the Earth. The scripture which we read dealt with the Sabbath years and with the Jubilee year. Every seventh year the land was to enjoy a rest. There was to be no pruning, no planting, no harvesting, the land was to go to weeds. Anyone could go into the field, including a passerby, and pick of the fruit and eat of it, but they could not carry any away. R.J. Rushdoony: 12:21 In other words, they could not harvest it. It was free there for anyone to eat, and for the birds of the field, and what fell was to lie there. They were not to do anything to kill the animals of the field at that time either. The gophers, the snakes, or the insects. Now, after seven sevens of years, a sabbatical year every seventh year, the 49th year then would be a sabbatical year. The 50th year was also to be a sabbatical year, but it was called the Jubilee, and that year, on the Day of Atonement the rams horn, or a trumpet, was to be sounded. “Ye, shall hallow the 50th year and proclaim liberty throughout all the land and to all the inhabitants thereof.” The words that are inscribed on the Liberty Bell, and when they were inscribed there they knew what it meant. R.J. Rushdoony: 13:39 But, the 49th and 50th year of each century, or the 99th and 100th year were a double sabbatical year. One thing you can see obviously when you weren’t going to harvest your year, your sabbatical year, and you had two years in a row when you did not, one thing that was required of all the people was providence. They weren’t living up to the hilt on their income. That’s a very plain, simple ordinary fact. It did require a provident people. But the purpose of these laws is not humanitarian, nor is it simply to teach providence. The purpose of the Sabbath is the Sabbath, that is a rest and release, a redemption and a regeneration. R.J. Rushdoony: 14:51 Now, the supreme Sabbath was the Jubilee Year. It was begun, as we have noted, on the Day of Atonement by the sounding of the ram’s horn or trumpet. Even as God annulled their sins, this was what the Day of Atonement was about, and forgave their debts, they were to forgive all debts, and to give the soil a rest, and rest themselves together with all their household, and all their livestock. The goal of the Sabbath, according to Hebrews, the third chapter, is the Promised Land, the new creation in Jesus Christ, the restoration and the restitution of all things. As a result, all debts ran out on the seventh year. They were canceled. Debts were to be contracted on a six-year basis. In other words, you couldn’t have a 10-year, or a 15, or a 30-year mortgage. You were supposed to have a six-year mortgage, or if you contracted it, it passed away between that time from one sabbatical year to the next, it was to be three and a half-year mortgage. R.J. Rushdoony: 16:18 A modern statuate of limitation on debts, by the way, is an adaptation of this principle. In that year also slaves were freed, and the land reverted to its original owners, so that land was leased only from one sabbatical year to the next, or from one jubilee year to the next. Man anticipated in the Sabbath years and in the jubilee, the final victory and the restored Earth, the new creation. Now, this great work of restoration, of restitution, of undoing the fall, included, by the law of God, the soil also. The soil was to be restored, to be revitalized. Everything was to be allowed to go to weed to revert to the soil, to be unpruned. R.J. Rushdoony: 17:28 Now, in recent years soil planted, notably at the University of Missouri, and one or two other institutions, have done remarkable work here, and they have learned that soil required weeds. Weeds penetrate deep down into the subsoil, and they bring up minerals, and they bring up water, so that things thrive better when some weeds are allowed to grow. When the land is allowed to revert to weeds the soil is revitalized, because the weeds bring up these things, and when the weeds the next year are plowed under it adds to the topsoil. R.J. Rushdoony: 18:24 I heard recently of an interesting episode that happened here in Southern California when a man whose orange grove was becoming progressively worse, and who had decided it was not fit to keep up, it was unproductive, let it go to weed and it sat there for a year with nothing done to it, and it revitalized the orchard. There is, of course, an extensive body of literature here that tells us the value of this, of allowing the land to lie fallow. Sir Albert Howard, one of the greatest of soil scientists, Dr. William A. Albrecht and Joseph Cokenower, and others have gone into this at great length and confirmed the validity of the Sabbath principle. R.J. Rushdoony: 19:25 We do know how many areas have reverted to desert, or have been converted into desert by the systematic exploitation of the soil by man. Babylon was once one of the most fertile areas in the world, a land flowing with water and now it is desert. The Sahara was once, although we find this difficult now to understand, orchard and farm country. True, the weather changed somewhat, but the real damage was done by an abuse of the Earth. Long after the weather changed many areas were still rich and fertile. There are many areas of the Sahara that have a rainfall equal to parts of the Midwest, some of our richest grain country. R.J. Rushdoony: 22:10 But, this 70 year long Sabbath of the land was God’s mercy. It restored the Earth there in the Promised Land to give Israel another chance. But, after they rejected Christ judgment came, and the desolation of the land. Palestine is not the same country now. No longer a beautifully wooded country, only a handful of the Cedars of Lebanon remain. No longer a land of spring and streams, but only dry, eroded land. Clearly, the renewal of the Earth is a basic concept of the Sabbath, as is the renewal of all things. To ignore this is to court judgment and death. The death penalty is operative here, very clearly. Just as money cannot be taken out of the bank endlessly, neither can the Earth be exploited endlessly, nor can a man work without food or rest. The Sabbath has a purpose then, and it still has a capital punishment attached to it. Men who will have no Sabbath are doomed to die prematurely. R.J. Rushdoony: 23:58 Unhappily in our day and age men believe that pills are a substitute for the rules of health, and that science somehow will figure out an answer to every contempt they express for good commonsense living. A man I knew and liked, a very, very kindly and likable person, killed himself, literally, because when he developed ulcers and they became very serious he continued drinking. He literally bled to death, and he was amazed when he was dying. He was sure that somehow a doctor could provide a pill which could counteract everything he was doing. After all, what was medicine and science for? R.J. Rushdoony: 25:14 Today, of course, we are putting our confidence in some kind of gimmick, and we are destroying the Earth, and we are destroying animals. Modern poultry methods produce nervous chickens. They only last a season, you know, and then they are sold off. It’s no wonder their eggs have a high cholesterol content; the chickens do. They’re nervous chickens. They’re kept awake 24 hours a day with continual lighting so they will step up laying, and they’re burnt out after a season. There is the same kind of stepped up pace with dairy cows, so that instead of lasting 17, 18, 19 years, as they did when I was a boy, three years and they’re through. R.J. Rushdoony: 26:15 Dr. Hans Selye, one of the great medical researchers, has written an important volume on The Stress of Life. A man has only the capacity to take so much stress and he is dead. Most of the stress, he said, comes from within, because a man has no rest within, no Sabbath principle in his life, no Christ. Man needs rest. He requires the Sabbath to live, but without faith he cannot truly rest or give rest to others, or the soil, or to animals. The essence of the Sabbath is the restoration, the renewal of all things, and Christ is first and foremost our Sabbath, and then in Him man is required to rest and give the rest to the Earth and all things. R.J. Rushdoony: 27:31 Having said this, we must note that the Sabbath is a Sabbath unto the law. It is a covenant sign according to Ezekiel 20, verses 10-13. The source of life is God, it’s Christ, not the law or the Sabbath in and of itself. It is not merely inactivity. As Dr. Selye has said, “The rest comes from within or is no rest.” It is resting in the law. “Oh rest in the Lord and wait patiently for Him and he will give thee the desires of thine heart.” The Pharisees reduced the Sabbath rest to physical inactivity and, therefore, they indulged in endless debate as to whether they could eat an egg or not, because after all maybe the hen had violated the Sabbath laboring over that egg the previous Sabbath. R.J. Rushdoony: 28:47 We must also say, finally, that forgiveness is a basic aspect of the Sabbath. It’s central to it. Remember that the horn of the jubilee, the trumpet of the jubilee, sounded on the evening of the Day of Atonement. Proclaim liberty throughout all the land and unto all the inhabitants thereof. Liberty from the burden of sin and guilt, atonement had been made. Liberty in the rest in the Lord. The Lord’s Prayer looks forward to the great Sabbath. “Thy kingdom come, thy will be done,” and it has, therefore, the great jubilee petition. “Forgive us our debts as we forgive our debtors.” The word trespasses, which is often used here, is a good translation in that it calls attention to the forgiveness of sin. But the word debt, perhaps, is even better, although I like the use of both, because it calls attention to the jubilee aspect. 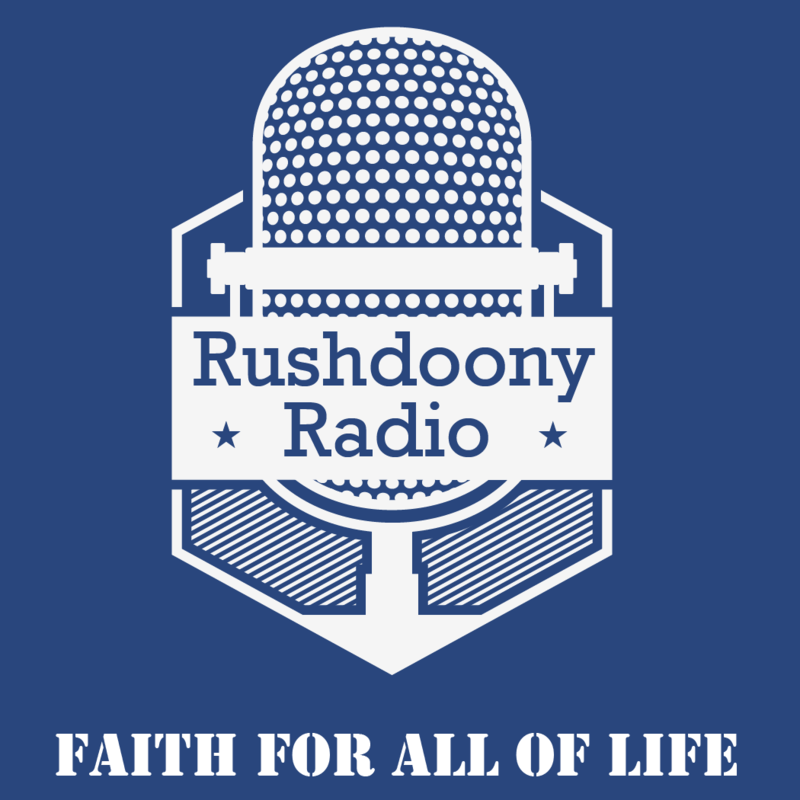 R.J. Rushdoony: 31:42 When God’s law is obeyed God declares you will have a debt-free, poverty-free society, and that this is possible only in terms of Him. A prominent writer on law has said concerning these laws, and I quote, “Modern statutes of limitation and bankruptcy acts fulfill the purpose of the ancient law of sabbatical relief. The former by forbidding the bringing of an action upon a debt after a certain number of years, and the latter enabling a debtor to turn over his property in satisfaction of his debt.” This particular writer goes on at great length to tell us how much these laws of the Sabbath have embedded themselves deeply in our American law. But, they are meaningless today, and they are abused because the heart is gone, Jesus Christ. The meaning of the Sabbath is not there. The Sabbath confers life, but to those alien to God neither the Sabbath nor its release can have true meaning. R.J. Rushdoony: 33:23 Let us pray. Our Lord and our God, we thank thee that there is a rest unto the people of God, unto thy people. We thank thee that in Jesus Christ we have entered into thy rest, and we pray, our Father, that in obedience to thy Word we may extend the sway of that rest unto the Earth itself and every living creature, and may bring the peace of Christ unto men and nations, unto the end of the kingdoms of this world might become kingdoms of our Lord and [inaudible 00:34:12] Christ. Bless us to this purpose we beseech thee. In Jesus name, amen.